In 1975, amidst a political atmosphere where indigenous peoples of Canada and United States were speaking up in opposition of Children’s Aid Societies’ massive removal of children, there emerged two grassroots organizers that would change the child welfare framework in Treaty #3 and Ontario. The stories told today revealed a dire need for changes in legislation, social work practice, and social work education. We are told that 50% of the children from Big Grassy First Nation were in foster care during the mid 1970’s. It was at this point that Moses Tom (Big Grassy) and Joseph Big George (Big Island) put their minds together to see what could be done for the children. They served notice to the local Children’s Aid Society that no other children would be removed from the community. They also asserted the fact that the Anishinaabe people have never relinquished their right to care for their children. Some stories speak of Moses and Joseph waiting on the road to turn CAS Workers away from the community. Moses and Joseph approached the local CAS and offered to work with them to ensure safety of children without removal from community. In 1977, the local CAS hired a dedicated worker to assist the communities of Big Island and Big Grassy. Also in 1977, Joseph Big George opened his home and became a customary caregiver (foster parent). Moses and Joseph remained the primary child welfare contacts within their respective communities until they were officially hired on March 1, 1979. Over the next few years each of the ten (10) First Nations hired Prevention Workers to assist the CAS in ensuring children remained in the community. This group later become known as the "Native Child Welfare Planning Committee". This committee was instrumental in developing the community care programs that exist within each of the First Nations today. Moses and Joseph remained active and instrumental in the development of Weechi-it-te-win. They both continued to contribute to the care and protection of children within the context of their customs, culture and communities. As they both entered elderhood, both Moses and Joseph remained a constant part of Weechi-it-te-win through ceremonies and events. The co-founders of Weechi-it-te-win Family Services were honoured last Wednesday during a banquet held in conjunction with the provincial native child welfare conference the agency hosted here. Keynote speaker Kathy Kishiqueb, director of Naaniigaan Abinoojii, told of the early work of the late Moses Tom (Big Grassy FN) and the late Joseph Big George (Big Island FN). “These two men from our 10 communities were our warriors,” Kishiqueb said. 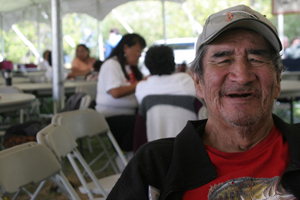 “They were the ones who went up to bat for all of us in our 10 First Nation communities back in the late ’70s. “I had the pleasure of working alongside these two men during our planning and developmental stages of Weechi-it-te-win,” she recalled. At that time, Kishiqueb said, First Nations’ communities were hit hard by the Children’s Aid Society (CAS) coming in and removing native children from their families and placing them in “foreign” homes. She explained this could mean the children were relocated within Fort Frances and Rainy River District, but some were placed elsewhere across Canada and even parts of Europe. “It was very rare that our children were maintained by our own people, by their own extended family,” Kishiqueb said. Kishiqueb noted Tom’s own children were in the system and he didn’t know where they were. And it was because of his struggle that he stepped forward on the behalf of the children in his community and all of the area First Nations. “He came forward and said, ‘No more.’ And at that time, Joseph Big George stood beside him and went on that journey with him,” noted Kishiqueb, adding they spoke to chiefs and the communities about their vision to fight on behalf of the children. 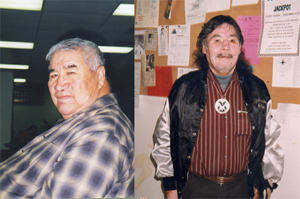 As a result, in the early 1980s, the Rainy Lake Tribal Area chiefs stood alongside Moses and Big George and formed a committee comprised of one member from each community. This committee looked at what was happening with the children in the communities, then made recommendations to the chiefs. They sent the message that no longer would the CAS be allowed to come into the community, take away their children, and place them where they had no knowledge of them and no connection to them. In 1982, the chiefs served notice to the government that this was going to change; that no longer would they accept what was happening. The following year, the chiefs agreed to enter into a tripartite, inter-governmental agreement among the Rainy Lake Tribal Area chiefs, the minister of Indian Affairs, and the minister of Community and Social Services. By 1987, Weechi-it-te-win officially was recognized as a designated child protection agency by then Community and Social Services minister John Sweeney. Kishiqueb said it was the vision of Moses and Big George, and eventually all of the 10 area First Nations, to give children the right and opportunity to be with their families and their culture, and be able to maintain their identity. This remains the vision of Weechi-it-te-win today, noted Kishiqueb, adding they’re still working to achieve this vision after 20-plus years. One continuing struggle has been how Weechi-it-te-win Family Services can use traditional systems to deliver care while, at the same time, doing what the ministry demands. In 2006, the board gave the directive that Weechi-it-te-win would not implement any regulations that potentially would hurt children and families, and doesn’t empower customary care under the traditional system. The board passed a resolution to the effect that Weechi-it-te-win would implement a harmonization of traditional and mainstream systems when delivering care. A plan was developed and the painstaking process of harmonization continues to this day. Kishiqueb said Ontario’s system works well for some, but not for everyone, including the 10 area First Nations. A lot of work still has to take place, but hopefully their own system can be developed without having to incorporate any government standards because although those standards are similar to Weechi-it-te-win’s, they’re not the right fit, she argued. “I ask the government to move forward with us in our journey of developing, formally, our system as a means . . . to look after our children and families,” said Kishiqueb. “We’re always open, we’re always extending our hand . . . to work together. “This year is a big opportunity to leave a legacy for our children, to formalize a process and a system that we know works,” she added. These portraits, painted by Atikokan artist Linda Fogg, are now hanging at the Weechi-it-te-win offices. The evening also featured music by “Nighthawk” and special guest performers Angus Jourdain (Lac La Croix FN), Kristina Bombay (Rainy River FN), Tim Grover (Couchiching FN), Ashley Bombay (Rainy River FN), and Ed Calder (Couchiching FN). The conference ran last Tuesday through Thursday at La Place Rendez-Vous. Some of the subjects covered included traditional law, traditional child-rearing practices, and traditional adoption to the Ganawendasowin Access Program and raising health families.